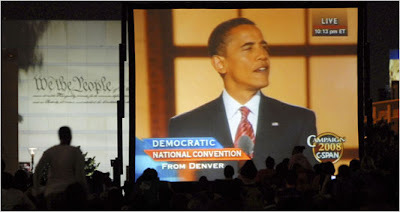 38 million watch Obama at Invesco Field Friday– making it the most-watched convention night in history. The total beat the Olympics opening ceremony, Academy Awards, or American Idol finale this year. The next Vice President of the United States? Post convention bounce or blip? Who are you in this for?